Instead of bringing citizen and state closer together, the 2010 parliamentary election increased the distance between many Afghans and their government. “Undermining Representative Governance” details this finding, showing that a majority of research respondents are being alienated by a process that increasingly appears like a rubber stamp on the control of established powerholders. This is because the pervasiveness of ambiguity and instability throughout the election process made it seem more like a long and sometimes violently negotiated political process, rather than an exercise to select genuine representatives. This was exacerbated by fraud and the wrangling over the release of results, establishment of a special court, and inauguration of the new parliament. Overall, this has compounded an existing distrust of national institutions. 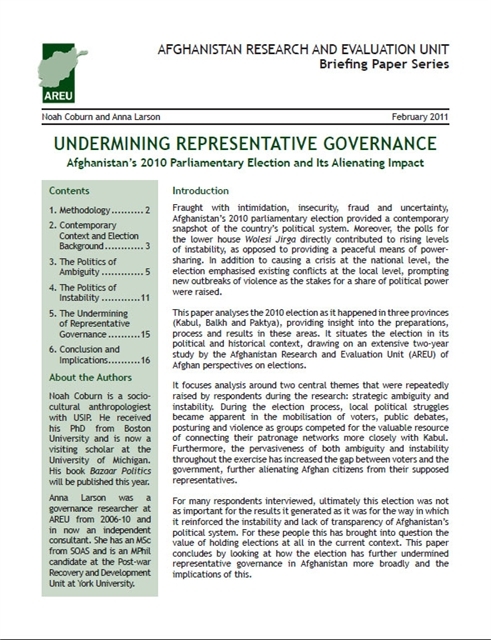 The report draws on in-depth interviews in Kabul, Balkh and Paktya Provinces and includes various accounts of election drama, which demonstrate different and sometimes surprising ways that Afghan elections relate to local politics. It concludes that sustained and vigorous reform driven by both the Afghan government and international actors is now necessary if the election system is to broadly serve the Afghan people. However, genuine change seems very unlikely because the instability of the current system instead means that it serves the interests of the powerful.